-How did you start your career as a Roadie? When was this? I started as a roadie as a freshman in high school in 1973, when I was about 14 years old. Two bands with members that went to my school, played at lunch time and I helped both of them with their equipment and became a roadie for each band. - Can you please tell us more about your job as a Roadie for Y&T who supported the biggest rock bands during their career? 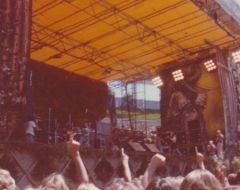 I first saw Yesterday And Today ( Y&T ) in 1974 where they won a battle of the bands. By 1975 they were playing big shows opening for bands like Queen and would borrow Marshall stacks from all of the local guitar players for the big concerts. 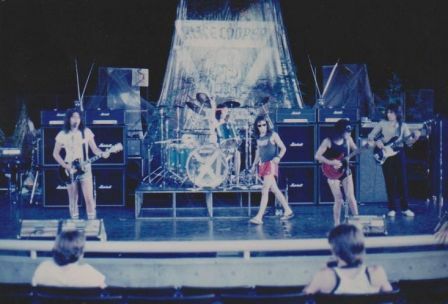 And by me bringing guitar amps for them and getting into the shows, I became friends with the guys in the band and crew and we did shows with bands like Van Halen and Motley Crue opening for us and doing shows with AC/DC, Montrose, Boston, etc. 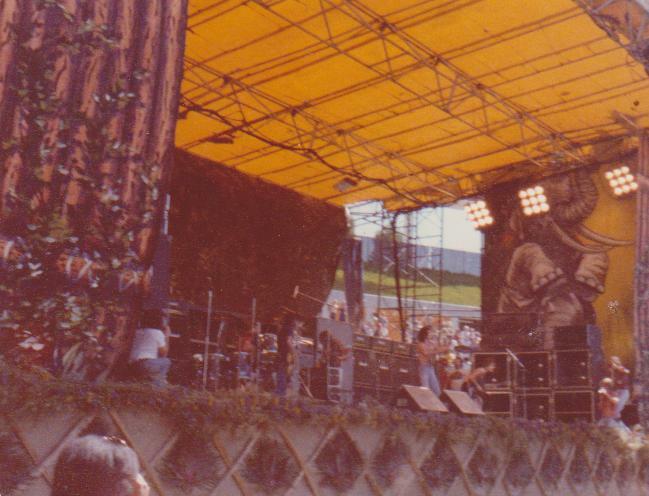 I ended up doing lights for Y&T in the mid 70's and worked for their manager and all of his other bands also. 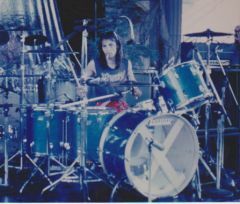 As the years went on I ended up doing more and more of the road crew positions as in guitar tech, drum tech, stage manager. - Did you work for other bands? I worked for many bands through the years but none that were as big as Y&T, but there were members in the bands that went on to very big bands. I toured with Randy Castillo of Ozzy and Lita Ford with his 70's band The Wumblies. I was a roadie for several bands with Troy Luccetta of Tesla when he was a teenager. 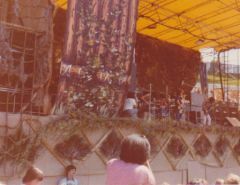 And the band I did a few tours with Mile Hi had almost all of the members go on to play with The Eric Martin Band and Greg Kihn Band. 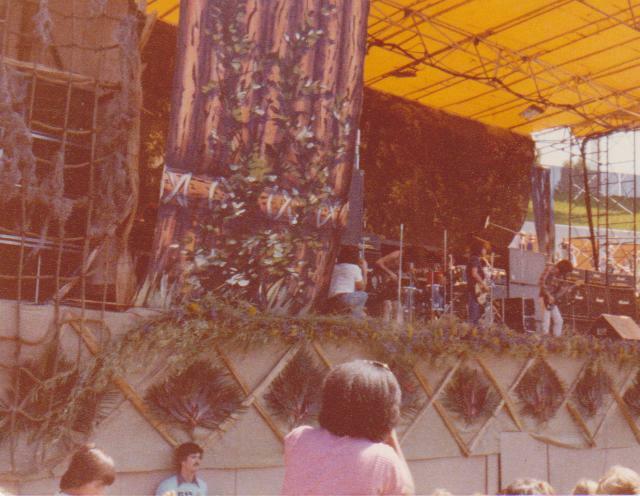 I also worked with Tiran Porter the bass player of the Doobie Brothers after he quit working with them in the late 70's and played guitar in Glide. - Roadie is one of the best job to meet your idols. Is it difficult to find the balance between your family life and your job/passion? It is funny how many big rock stars I have met and hung out with and some even partied with through the years. It wasn't cool to always be asking for pictures and autograghs and stuff like that so I never really got a lot of that. But I have great memories of all the hundreds of concerts I have done in my carreer and kept all the fliers and tickets and backstage passes, etc. 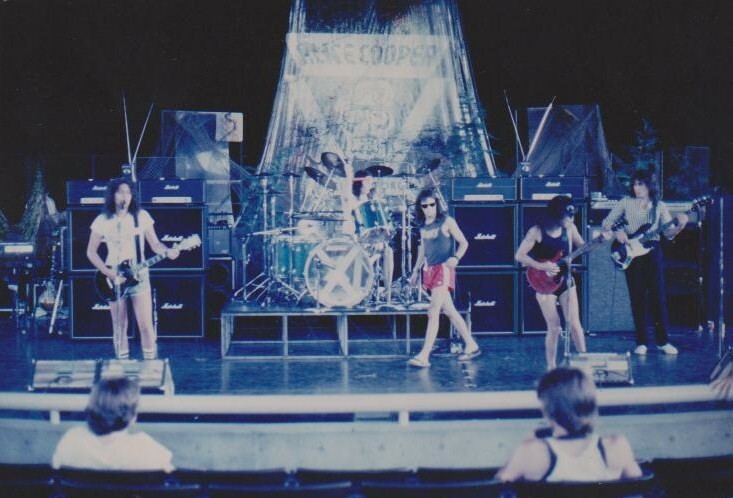 In the 70's and early 80's I would go to see all the new bands playing in the big night clubs and show up at load in time and help the always short handed crews. That's how I met AC DC, Judas Priest, Motorhead, Sweet, The Damned, and many more. Just show up at noon and come ready to help get the job done. I quit doing long tours after getting married in 1985, but I still go out on short road trips when I am needed. I ended up worked as a union stage hand for 10 years in Wisconsin and got to see many of my old tour mates come through on tour. - How is the typical working day like for a Roadie, on tour? You pull into town after driving all night and drop the band off at the hotel, then you go to the venue and get the equipment unloaded. You get everything set up and ready for the sound check where the band will be brought to the venue for about an hour to play a couple of songs to check out the sound system and make sure everyone can hear each other good. Then the band leaves and you have to clean the drums and shine the cymbals and guitars and tune them all and make sure nobody messes with your equipment. And then it is the time for the roadies go out to the lines of people waiting to get in and a pick out some pretty ladies to take backstage before the band comes back. Then it is show time and you must focus on the stage and your job during the live performance. And afterwards it is pack it up and get it in the bus to head to another city and another show. - Would you recommend this job to young people? This is a great job for anyone who likes to travel and be a part of something bigger than themselves. It is all about finding new and local bands that need help but can't pay for a road crew and learning more with each and every show you do by helping and asking questions and finding out how to do a little bit of everything. So you are a total asset to any band on tour. Learn how to set up lights and sound and drums and run the boards and tune the guitars. - Generally speaking, on tour, is the relationship between Roadies for two different bands good? That is a tough question because there are bands and crews out there that always screw the opening and support act by not letting them have very much room on stage or lights or any special effects or sound checks. But if the bands are friends and both about the same level their crews all work together without too much trouble. - How do you coordinate when they share the same stage? Once the band that played before you is done and their equipment is off of the stage then the next band ownes the stage and is in control. The first bands crew is very busy off stage getting equipment stored in cases and put into the truck. 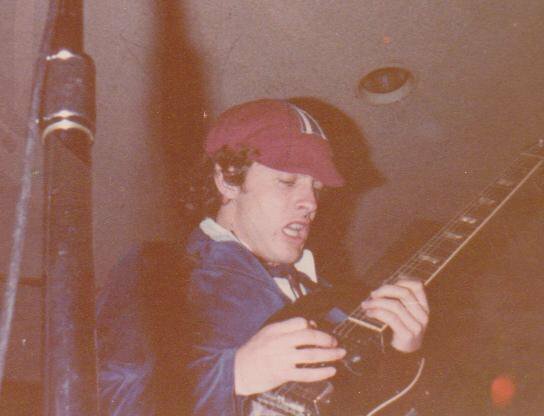 - Your picture of Angus Young - (San Francisco, Old Waldorf, September 1977) is amazing. Do you remember the exact date? do you remember this concert well? the atmosphere? AC/DC's performance and anecdotes? It was September 3rd 1977 when I met and saw AC DC for the first time. I was waiting for them when they got to the club and helped bring all the equipment from the basement garage up to the top level where the club was. I was there for the sound check and dinner with the band and then I got seated in the front of the stgae before they opened the doors. When my friends got inside I had them front row seats all saved and Phil Kennemore of Y&T sat next to me. I saw AC DC several time with Bon and the first was and will always be my favorite. - What was your first reaction when you saw AC/DC on stage? I was watching this mello little guy who I'd met during the day strutting back and forth across the stage in a school boy outfit and cap with a cigarette in his mouth just looking at us and puffin on that smoke while the band was playing the intro to Live Wire. Then he stopped right in front of me threw the cigarette down on the stage and rubbed it out with his foot and then he turned his guitar to 10 looked at me with a great big grin and then went totally crazy and his hat went flying. I was blown away at his head banging and running around the stage and started getting just covered in his sweat. - is it true Angus walked and played on tables that night? - What makes Angus special? Angus is a total showman and he lives for entertaining a crowd and I have never seen him live where he didn't give the people their monies worth of energy and ROCK !!! - Bon Scott was one of a kind. His presence, his eyesight, his charisma. What was your relationship with him? as a frontman, as a man behind the curtain? Bon was a very funny guy and loved to laugh and was always joking about someone or something. And on stage he just had that swagger to him that made him a one of a kind frontman. - What do you think of AC/DC's evolution over the years until today? 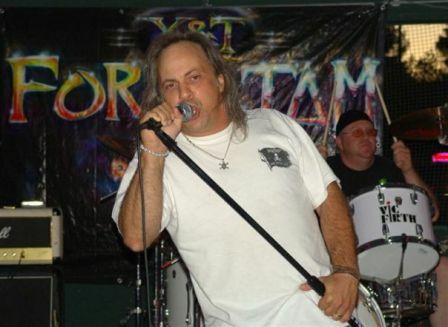 I think that it was great that the band was able to find a singer that could do justise to Bon's songs and to be able to grow with the band through the years and keep AC DC going for several more decades. - Do you still consider them as a Rock'n'roll band or has the band become more of a business enterprise? They are still just a band at heart and I know they still love their fans and want to give them the best show they can give. - You were working for Y&T. How was the relationship between AC/DC and Y&T? Do you have any anecdotes about this? 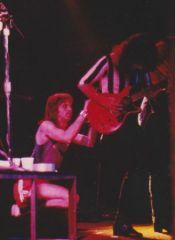 AC DC and Y&T got along great and admired each others talents and enjoyed touring together. - Who was the leader in AC/DC at that time? Was it Malcolm? I never saw anyone in the band being the leader back in the old days, I think they all played a part in what was going on. - How did you discover AC/DC? What are your favorite albums? I had a friend named Henry "Metal" Bentley in San Fransisco, that collected import albums in the 70's and he turned me onto many of the early metal bands like Judas Priest, Scorpians, AC/DC, etc. He played me the High Voltage album and then told me they were coming to the Old Waldorf. - Have you seen them live with both Bon and Brian as a lead singer? How did you react to Bon's death? I have seen them many times with Brian and he is a good guy and a good performer. I got a call in the middle of the night from their roadie in England the morning they found Bon dead and I had to hake up my roomate Leonard Haze of Y&T to let him know our friend was gone. And after we got off the phone we opened a bottle of Jack Daniels and drank a shot to Bon and cried in our kitchen. Then I went to my stereo turntable and the import version of High Volatage was on and I hit the play button and it went right to Baby Please Don't Go and really freaked me out. - Your picture of Angus is the only one you managed to shot because of a problem with your gear right? do you have other pictures of the band, lick backstage? - What is your current job and do you have any projects? - Do you have a message for www.highwaytoacdc.com and its members?